Bernina Pass (Passo del Bernina) located on the border between Switzerland and Italy, connecting the alpine resort town St. Moritz with Tirano in Val Poschiavo, is a 365 days a year road. It does not mean you should drive it without proper winter gear in the coldest season, because when there is snow on the road there is a lot of it. However imagine yourself planning a road trip through the Alps early spring or late autumn. The majority of the scenic mountain passes are closed unless you are travelling between June and October. Your options are to stick to the open roads, and probably end up doing most of the drive on the highway, or find the mountain passes that stay open also in the winter. 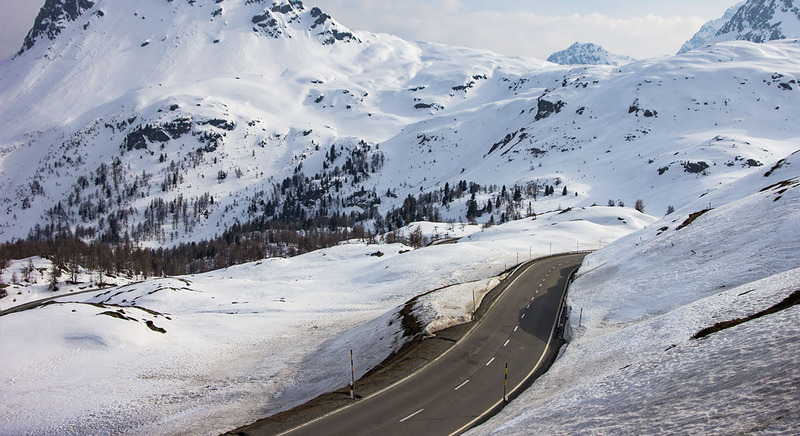 If you are looking for a sports car friendly Swiss mountain pass in April-May or October-November, and come equipped with summer tires only if you happen to just be crossing through the country and heading to a warmer place, Bernina Pass might be the road you should consider. What you could find there is a stunning winter landscape, a road framed by snow walls with some beautiful hairpin bends, yet the road surface could be dry enough for safe fun driving. If you start your drive in Switzerland you will drive towards Pontresina, less than 10 kilometres from St. Moritz, from where the climb up to 2,328 m starts. After the lakes and Ospizio Bernina you can either continue your drive straight to the end of Bernina Pass, and arrive in the Italian town Tirano, or turn left and drive to Italy over Livigno Pass instead. If you are heading towards Stelvio Pass you would do the left turn, however if you are on your way south to Italy going straight is the fastest route. In the summer months there are several scenic roads to choose from if you want to get from Switzerland to Italy or vice versa. Splügen Pass, Umbrail Pass, Ofen Pass or even Great St Bernard Pass located on the other side of Switzerland. Bernina Pass is one of our personal favourite driving roads all year round, and no matter what season we go we always enjoy it. The journey takes you through the same landscapes as you would see from the historical Bernina Express train. But to be able to take a sports car up on a scenic high mountain road in April or May, when you are banned from driving on the majority of the other passes in the Swiss Alps, is quite something. And for that reason Bernina Pass is without question the road we wish to kick off our driving season in the Alps with, year after year.